The wild story behind Vittore Carpaccio’s paintings (1497-98) in the Gallerie della Accademia is that of Ursula, daughter of King Maurus of Brittany, as it appears in Jacopo da Varagine's Golden Legend. Commissioned by the Loredans, the great patrons of the Scuola di Sant' Orsola, Carpaccio had considerable scope in interpreting the events, distant in both place and time, and went about it with his customary verve for the narrative and the literal, though naturally most of the details are from the Venice of his day. In the first scene, The Arrival of the English Ambassadors, the ambassadors are asking for the hand of Ursula for Hereus (Erero), son of the pagan English King Conon; its very Venetian background contains a centrally planned octagonal Renaissance temple. To the right we see Princess Ursula dictating the conditions of marriage to her father; marry she will, but on the condition that she be allowed three years to make a pilgrimage to Rome, and that Hereus convert to Christianity. The Return of the English Ambassadors shows the Englishmen presenting the conditions to King Conon, a formal scene rounded out with a triumphal arch and a monkey on the steps. Good egg that he is, Hereus accepts Ursula’s conditions, and even offers to accompany her to Rome. In the next painting, he meets Ursula and together they depart for Rome in a 15th-century Venetian galley. 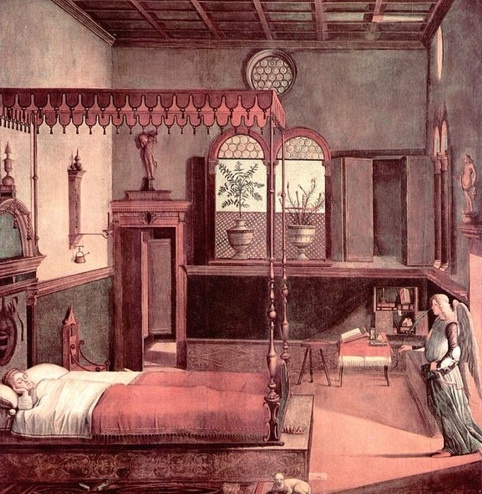 But next the princess dreams of an angel foretelling her martyrdom – Carpaccio has the saint tucked in her little bed, slippers tidily arranged underneath, her crown at the foot of the bed, while the angel, like any mortal, comes in the door. You can listen to Ruskin's description of the scene from the Fors Clavigera here. Despite the dream warning, Ursula, Hereus and some fellow travellers – 11,000 virgins – continue to the Eternal City in the next painting: The Pilgrims Meet Pope Ciriaco before the Walls of Rome. There are almost as many bishops as virgins, and their crocodile hats make a surreal pattern. Together with the Pope, the pilgrims travel to Cologne (Arrival at Cologne), badly timing their arrival to coincide with a siege by the Huns, although the flags flapping over the tower belong to the Ottoman Sultan Mehmet II—the great enemy of 15th century Venice and the Loredans. Ursula refuses to marry Attila, and the Huns, as prophesized, then send her and the other 11,000 to their reward in the Martyrdom of Pilgrims and Funeral of Ursula.